Stan Getz is probably best known to the ordinary man in the street for helping to introduce Bossa Nova to the general public most notably with his recording of Desafinado for which Getz won the “Grammy” for best Jazz performance of 1963. However his musical career has far greater depth. at the age of sixteen in 1943 he joined Jack Teagardens Band, later he was to work with some of the most notable bands of the day including: Nat King Cole and Lionel Hampton. 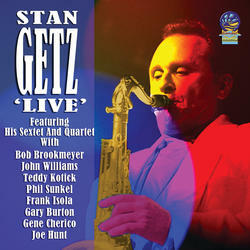 His performance with the Stan Kenton Orchestra brought him further acclaim as did his work with Jimmy Dorsey, and Benny Goodman, Getz was a soloist with Woody Herman from 1947 to 1949 in “The Second Herd”, and he first gained wide attention as one of the band’s saxophonists, who were known collectively as “The Four Brothers”, the others being Serge Chaloff, Zoot Sims and Herbie Steward. With Herman, he had a hit with “Early Autumn” and after Getz left “The Second Herd” he was able to launch his solo career. He was the leader on almost all of his recording sessions after 1950. The recording on this CD date from that period and feature both his Sextet and Quartet performing “live”.